Winners will be announced during MomoCon 2015 in Atlanta, GA. 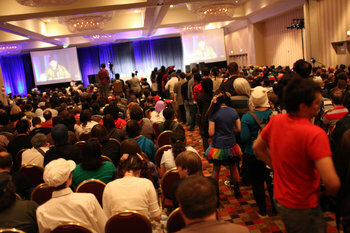 Going on its eleventh year, MomoCon is one of the largest conventions in the southeast and is geared toward enthusiasts of video games, animation, cosplay, comics, and tabletop games. Just one of MomoCon's many attractions include the MomoCon Indie Game Awards, highlighting exceptional indie games and indie game developers. The twenty finalists for the MomoCon Indie Game Awards have been chosen from over 120 entries and each title will be available for play by MomoCon guests during the convention, from Thursday to Sunday, May 29-31 2015, with the announcement of the five winners on Saturday, May 30, 2015. Can't make it to Atlanta? Don't worry; you can watch the award ceremony live on Twitch at 5PM EST on Saturday, May 30, 2015. The devs of the winning games will receive some great prizes including a "$1000 prize, a 10 x 20 exhibit space at MomoCon 2016, a dedicated Panel at MomoCon 2016, a highlighted placement in a MomoCon newsletter going to tens of thousands of gamers, and a glass trophy". "It was very difficult to narrow down the top twenty from a group of submissions that showed so much creativity and talent" said Chris Stuckey, CEO, MomoCon. "We look forward to having a strong indie presence at MomoCon in addition to the numerous panels from AAA developers." We at The Escapist are honored to be a part of MomoCon's panel of judges for the Indie Game Awards this year. Take a look at the twenty finalists and let us know your thoughts on who should be crowned a winner.